While it may seem somewhat unnecessary to make your own DIY Fabrication Tabs, you may be surprised at all the reasons that you can come up as to when it can be very helpful. Fabrication tabs are really a basic item in fabrication and they seem almost so simple that you may even wonder why bother showing people how I make my own tabs. Well... there's a real reason for it. 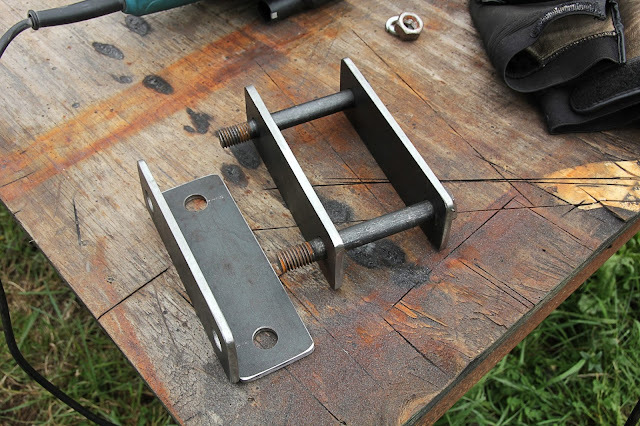 One reason that I can think of, is that I have run across a few applications were I needed a tab with a specific spacing from the center of the hole to the weld points, but couldn't find any pre-made tabs. Another reason that I've run across, is the accidental breakage of a tab and the need for immediate repair. Not having time to wait for an ordered tab to get to you. Ok... So, there are a few reason when making your own tabs can be very beneficial, but seriously, how hard can it be? Honestly, it's not so much an issue of being creative enough, or one of super technical processes. It is one of proceeding in a planned order though. Something important to think about with my episodes, are that I'm creating them for those who are trying to fabricate with the most basic of tools. Many times, this includes using tools such as hand drills instead of drill presses, and angle grinders instead of plasma cutters. Therefore, if you don't do things just so, you could come out with very unaligned or uneven bolt hole placement. This creates a difficulty for the tabs to be appropriately applied to any specific application. Not to mention you may spend a bunch of time on a part you end up having to throw out in the end. So, the first thing for any tab fabrication is making sure you have the appropriate material for the kind of tab application needed. When trying to find out if a material will work for your need application, think about the following questions. - Is the material long enough and wide enough for the tabs I need to make? - Is the material thick enough for the function and fabrication of the tabs I need to make? - Is the material strong enough for the tabs application? Once these questions are answered, you'll need to think about 2 other questions. 1) what is the best and most efficient way to make the tabs from the material I have? and 2) How much space do I have for adjustment if I make a mistake in any specific part of the process? While almost anything in metal work can be fixed, if messed up by a mistake, how much time will you loose if you have to fix a mistake? So, the obvious answer is to make the part right the first time, and save yourself time and money. Here's how I make a tab efficiently. First Step: Make the bolt hole. When making your bolt hole, you'll want to make sure that it is placed in the appropriate location relative to the tab use. To do this, you'll want to use a punch, or a sharp, small drill bit and start the pilot hole. Once a pilot hole has been made, assuming that it's in the appropriate location, you will want to open the hole up with a hole saw or a drill bit that is the final desired size. Second step: Make the minimal shoulder around the bolt hole. Never forget that if you get to close to the edge of the bolt hole, the metal could start to fold, tear, or sag under force. Because of such reasons, I tend to make my tabs with at .25"-.375" shoulder (border). Third Step: Drawing out the Shape of the tab. Making sure not to draw a cut line that would make you cut, grind, or sand into the boarder/shoulder thickness, you will want to draw out the tabs general shape. While doing this, never forget were in the line you should cut. Be it on the outside, inside, or center of the drawn line. You'll want to cut consistently. It's also, always a good idea to think about how much kerfing will be taken out by the thickness of the cutting tool used. Every cutting tool has a measure of kerfing, or material lose due to the blades thickness. Fourth Step: De-burring and refining the product. While you may want to finish sand and polish your fabrication pieces once they are all finished, you will want to get the first piece rough finished to the correct size so that it can be used as a template. Once all the pieces are duplicated, then you can finish the sanding and final polishing before installing them. While polishing isn't absolutely necessary, de-burring should be done for safety reasons. Fith Step: Duplicating a Tab. When you start to duplicate a tab, most peoples natural instinct is to start by drawing the template out, cut the piece, and then drill the hole. However, I've found that when using a hand drill (even with a punch) it's hard to get the hole perfectly aligned within the tab so that is matches the original perfectly. Due to this, I always drill the hole in a raw stock piece first. Then I align the hole of the 1st piece that I made up with the hole in the raw stock (duplicate) piece. Once that's done, I check everything to make sure there is enough space around the template piece to cut, sand, and polish a duplicate. Then trace the templates shape on the raw material and cut it out. Clamping the duplicated pieces together with the original piece can also be a good sanding guide to make sure they end up being equal. Just be careful not to take of more material than desired on the original/template piece. Once this process has been duplicated as much as you need, you are finished. To see a speed up version with an explanation of all this, make sure the watch the video above.